Native American dwellings come in a wide variety of shapes and sizes. 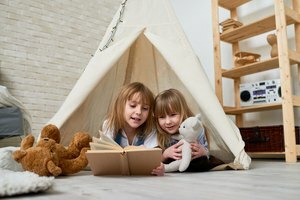 Little ones love the funny sounding names of Native American dwellings and they will love constructing their very own models of these homes with some easy, hands-on crafts. 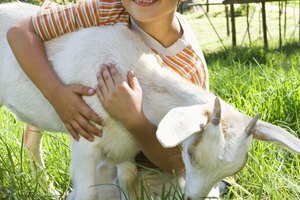 Let your imagination take you and your child on an educational and artistic adventure as you create your own Native American village. Native American tribes of the Southwest often lived in pueblos. These structures were made of adobe and built close together, often housing several families. Reconstructing a pueblo with your child is easy. All you need is some modeling clay or play dough and a little imagination. Form the clay into blocks that you can stack one on top of the other. Help your little one form windows and doors with his fingers. Build ladders out of twigs from your front yard to finish off your pueblo project, placing them from level to level of your dwelling. You can help your little one glue the twigs together or tie them up with string or rubber bands to make the ladders a little sturdier. Tipis are probably the most commonly recognized Native American dwelling. 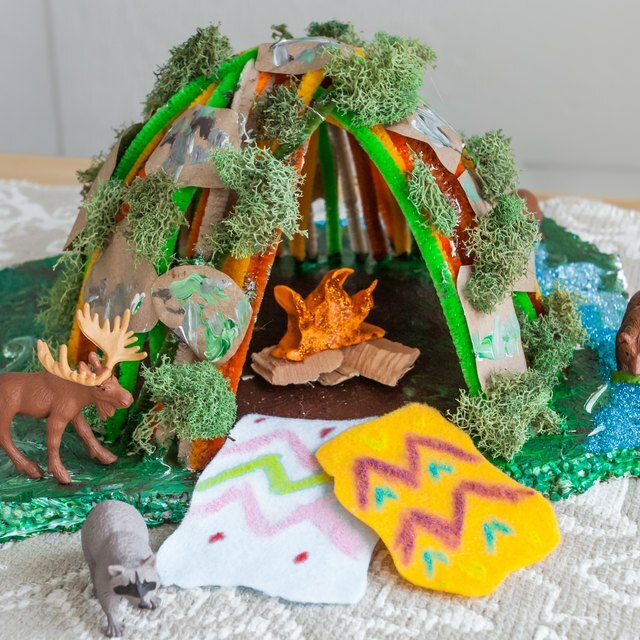 You can create a model of a tipi using a variety of materials. Let your little one dress up a plain piece of paper with some stickers or stamps. Use the custom-made paper for your tipi by rolling it into a cone shape around three plastic drinking straws and securing it with glue or tape. 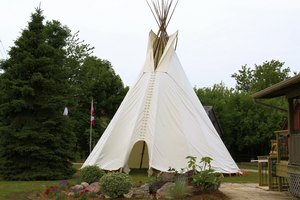 You may want to take your model a step further and use a piece of cheese cloth or muslin for a textured tipi. Wrap the fabric around three sturdy twigs that you have tied together at the top. 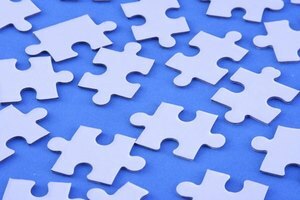 Help your child attach the cloth on the opened side with some fabric glue or adhesive hook and loop fastener pieces. The Woodland region Native Americans lived in houses called wigwams. Wigwams are dome-shaped houses that were small and easy to build. These dwellings were immobile. You and your little one can re-create a wigwam with items found around your house or in your own backyard. Use some plastic straws, pipe cleaners or basket reeds to create the desired shape of your structure. Take some brown construction paper and rip it into small squares and begin layering them from around the bottom of your wigwam to the top, gluing or taping them as you go. Make sure to leave an opening for the door. The Native American dwelling referred to as a longhouse is a larger, stretched-out version of the wigwam. Kids can create a longhouse by constructing a frame that represents the shape you desire for your longhouse. Sturdy cardboard is an ideal material for creating a longhouse model. Give your child a large piece of cardboard and help him fold the sides and ends to make a rectangular-shaped dwelling. Cut out a door at one end and use twigs to decorate the front of the longhouse. Longhouses typically featured an awning at the front, which you can easily add by cutting out smaller pieces of cardboard and using more sticks to construct a front porch-like structure. Harvey, Pamela. 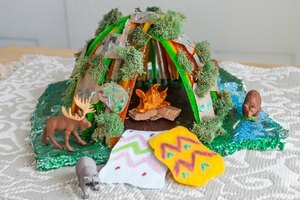 "Native American Dwelling Crafts for Kids." 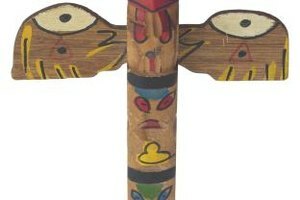 Synonym, https://classroom.synonym.com/native-american-dwelling-crafts-kids-46308.html. 26 September 2017.